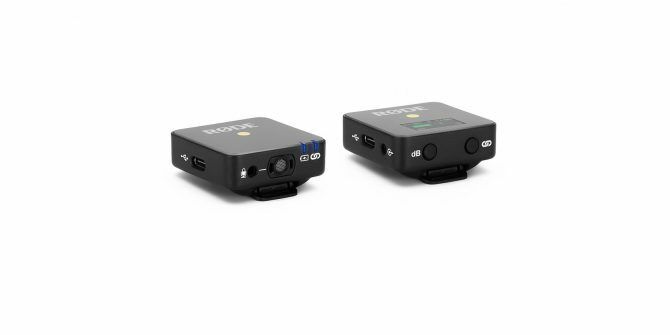 RØDE, one of the largest companies in the world of high-end microphones, has just revealed the smallest digital wireless microphone and receiver on the market. The device, which is called Wireless Go, will be on display at NAB 2019 in Las Vegas. However, we have some information available on the microphone now, and it looks quite exciting for anyone who creates content. The company has revealed a pretty exciting set of features for the new wireless microphone and receivers. According to RØDE, the system comes in two parts. First, there’s the receiver, which it calls RX. Then, there’s the transmitter, which it calls TX. The two parts work together to create tons of quality sound in a package that’s super tiny. The receiver is incredibly tiny, measuring only 44mm x 45.3mm x 18.5mm and weighing just 31g. The transmitter is similar in size, coming in with dimensions of 44mm x 46.4mm x 18.5mm and weighing just 31g. It can serve as a quick and easy clip-on microphone with its built-in omnidirectional condenser capsule, or it can act as a tiny wireless transmitter for a lavalier microphone. The transmitter is meant to be easy to carry around since it’s so tiny. When compared to most other transmitters on the market, it’s absolutely tiny. It’s designed to sit on a camera’s shoe mount or clip onto an article of clothing, which makes it quite versatile for a wide range of shooting situations. The company plans to ship the device in April, though it hasn’t revealed pricing information just yet. RØDE did cite “unmatched price accessibility,” though, which means it should be reasonable for content creators 6 Simple Tips to Shoot Better Video 6 Simple Tips to Shoot Better Video Becoming a good videographer requires a unique set of skills. So, with that in mind, here are six simple tips to help you shoot better video. Read More to get their hands on a set.